Not much to tell. It’s very mellow here. It’s hard to make any kind of tormented art on Maui. If I stayed here too long, I’d only be painting rainbows, beaches and sunsets. Maybe even orphans and unicorns, God forbid. But don’t get me wrong, I feel great here. I am loving the warmth, the sun, the relaxation time. The tree I drew at Makena Landing in black and white, at least, is not as much like a pretty tourist postcard. Maui does have a wild side, it is born of volcanoes after all. And the ocean storms can pound its coastline. It has a large variety of climate zones, its tiny size encompasses elevations from 0 to 3000 metres, thanks to the Haleakala volcano. 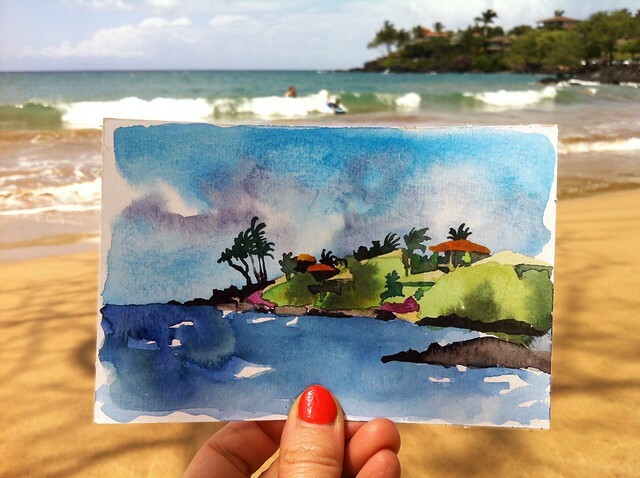 The watercolour sketch below contrasts nicely with my orange nail polish. I love orange. And I am feeling very, very sleepy now… I think I’ve drunk the Maui Kool-Aid.